Anyways, here's how I organize my school life and I hope it gives you some tips on how to organize your own as well! 1. Tackle the pile of papers. As disciplined as you can be, we probably all have those loose sheets of paper gathering in the depths of our bags and around our desk. Oh, and did I mention that I've a had pile of paper in the corner of my room since Spring Break waiting to be organized? My first step is to go through my school bag and my room, gathering a huge pile of loose papers. After studying for various tests over the year, my textbooks end up scattered all over the place. Now would be the time to restore them to a little corner on your desk or on a shelf. I usually sort my papers into ten different categories. Eight of these belong to the courses I'm taking at school, another is for miscellaneous papers which do not have designated folders and the final one is for and unwanted paper that can still be used for scrap brainstorming and math calculations (yep, I'm a nerd). 4. Put the papers in their rightful homes. 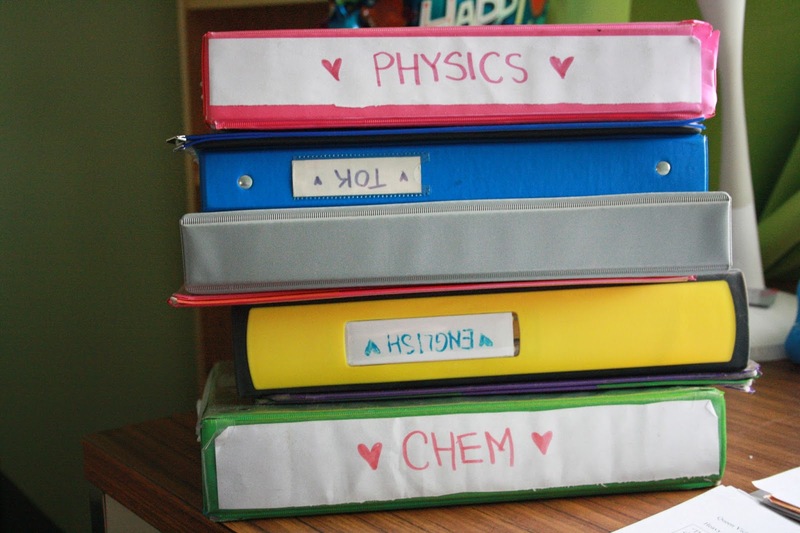 Now that you have all your papers sorted out, it's pretty easy to just grab your binders and add the papers. Sadly, it takes far too much time having to match each individual page's punched holes with the rings on the binder. 5. A table of contents is easy to make and will go a long way. 6. The "One Binder Fits All" experiment. 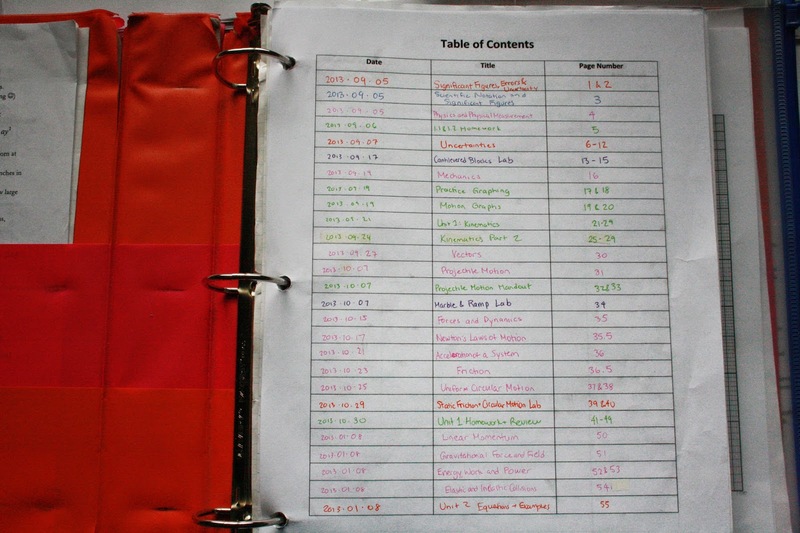 This year, I have been trying out a new way to organize my school work. Instead of keeping a chaotically messy locker full of binders at school and lugging them home on nights before tests over a one hour bus ride, I've decided to keep them all home. Instead, only one binder stays in my bag at all times and I just add whatever I need for school in the morning and take out what is unneeded at night. Of course, I'm not completely disciplined on emptying my binder everyday, so I go through the method of taking out any unnecessary sheets, organizing them into ten categories and putting them in the proper binders. 7. 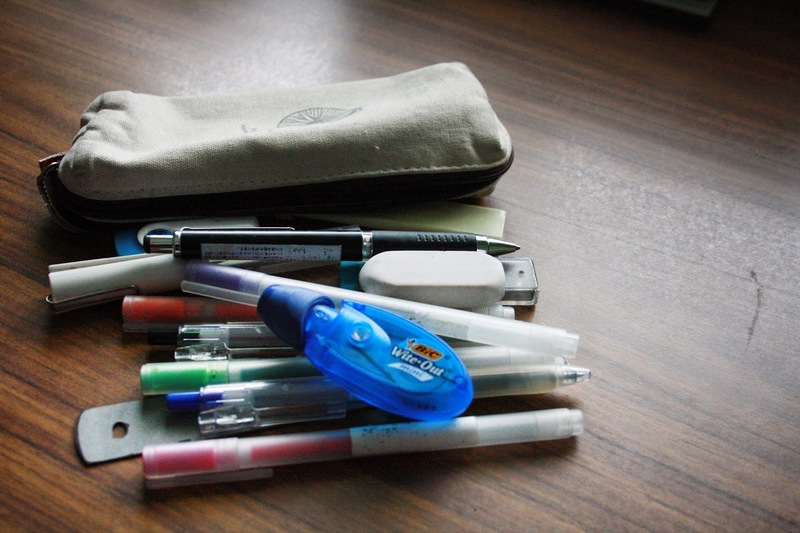 A small pencil case is a clean pencil case. I love my pencil case. 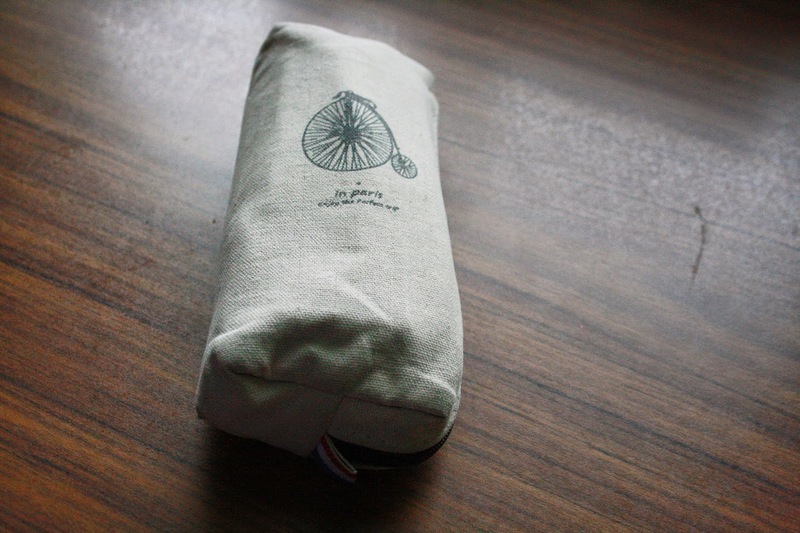 It's a small canvas pencil case my cousin (I think) bought me from the Japanese stationery store, MUJI. Actually, all the contents of my pencil case are from there as well... In my last post, I said that the best face care products can be found in Korea, and now I'm telling you that Japan makes extremely high quality stationery for school. 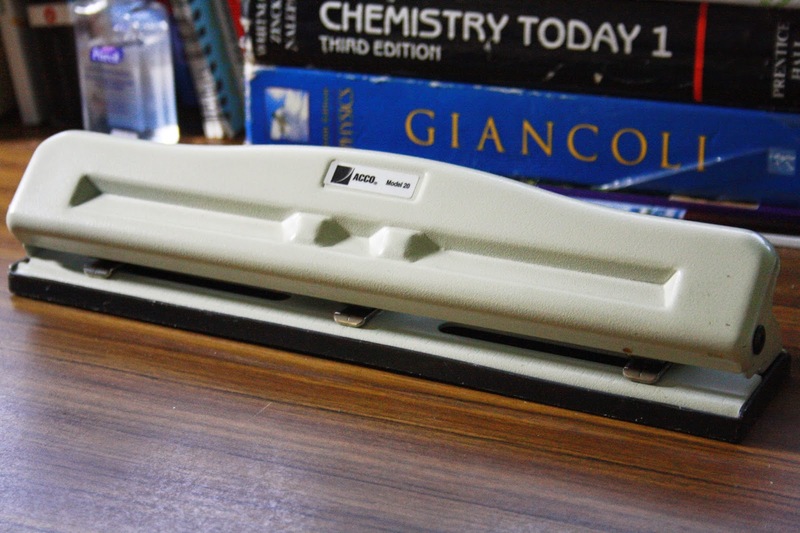 I used to be that kid with the huge pencil case which was full of mysterious pencil shavings and random useless objects. This year, I took the approach of only bringing one pencil to school, along with one eraser, refill led, a mini ruler, scissors and one pen of each colour. It's been so much easier to keep track of my pens, and another plus to this is that you won't be able to lend any pencils to people who may lose them or never return them! 8. Don't be in paper debt. How many times have you heard the phrase: "Can I borrow a sheet of paper?". For me, everytime I hear that sentence, I think of how it's not really possible for them to 'borrow' a sheet of paper haha. You do not want to be that person who always walks around the class asking for paper. 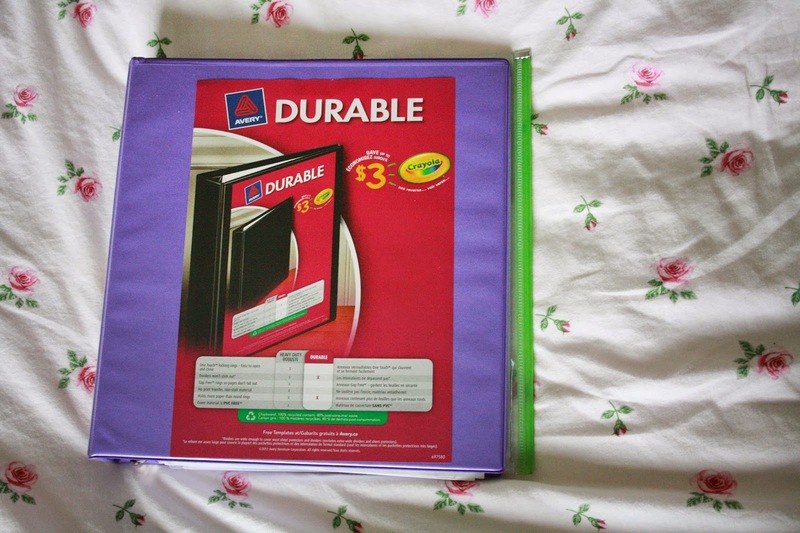 Though there's nothing wrong with that, let's save you the trouble and restock on some paper in each binder, hm? 9. That moment when your teacher gives handouts without holes and all the effort you put into organizing your binder just disappears. 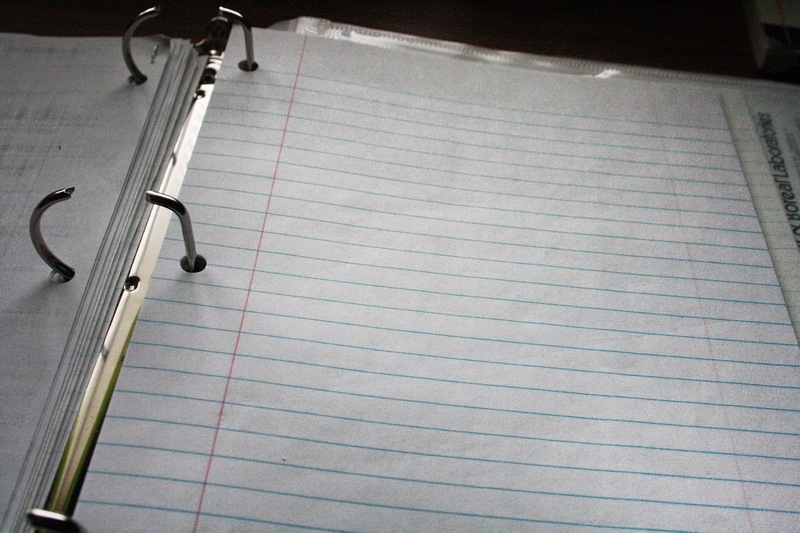 If you have any papers crammed into the pockets of your binders or just kept between the cover of the binder and your first page of notes, make sure you punch some holes into them and add them to the rings. 10. Hide the chaos with boxes. You'll never be able to organize everything. 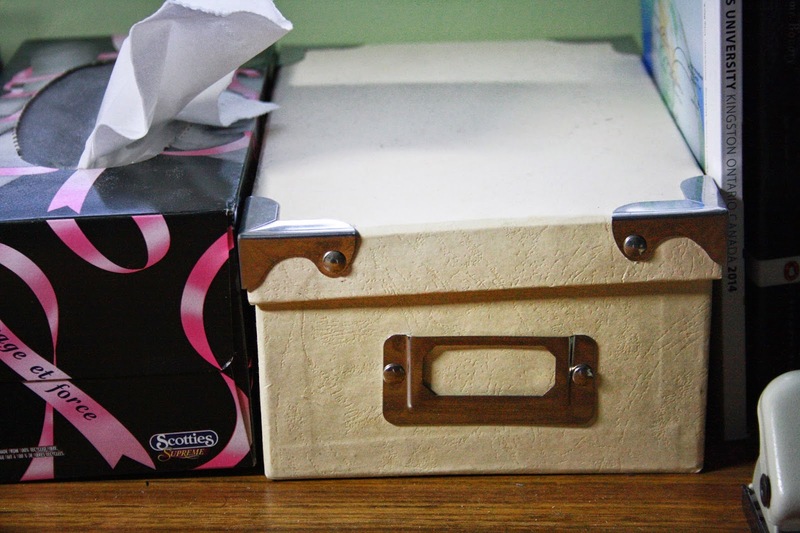 There is simply not enough room to organize your clutter. This is where boxes become your best friend. I keep a medium sized box under my desk to hide my inner hoarder. 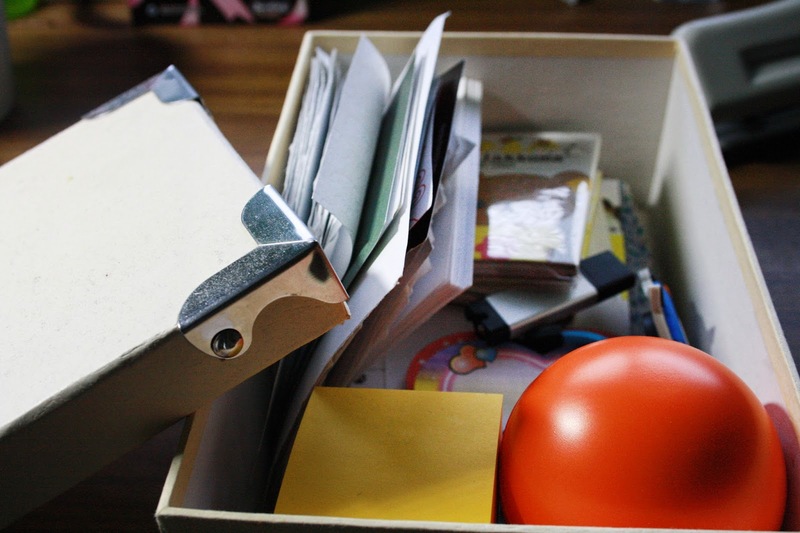 I get easily attached to objects that hold some sort of memory with them, and this is a way to keep the clutter away from the open, but still be able to keep them and take a trip down memory lane occasionally. This smaller box on my desk, however, contains any study items I would need other than the pens in my pen holder and the notebooks next to my textbook stack. In other words, I have stacks of sticky notes, bookmarks, rulers and... a random stress ball? 11. You love wearing clothes, but you hate folding them. 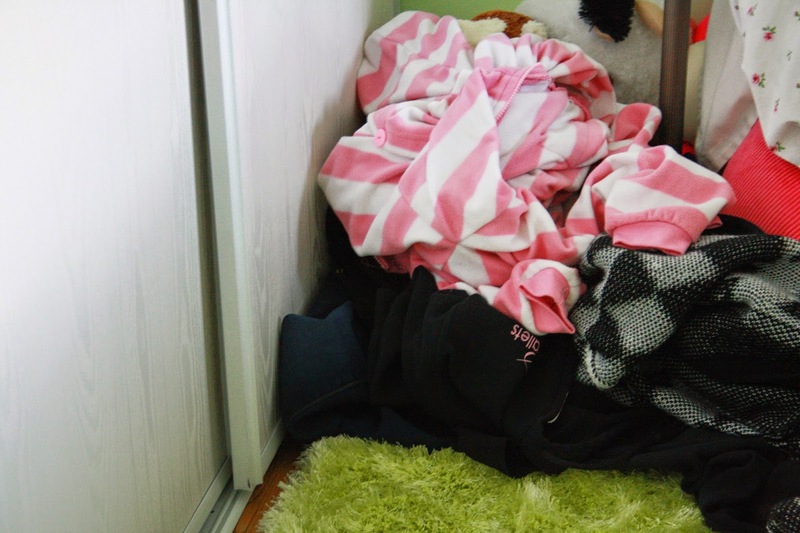 We all have that pile of clothes somewhere in our room. Lately, I've been studying so late that I'm already half asleep before getting into my bed. There's definitely no time for me to be organizing my clothes from the day of and for the next day. Now would be the time for you to pick through the clothes to find anything that needs to go in the wash or hang up any jackets and sweaters that are lying around. 12. Bags are a girl's best friend... until you trip over one. After a day at school or a day out in the mall, I have a bad habit of throwing my bag somewhere in my room and leaving it there until it gets in my way. 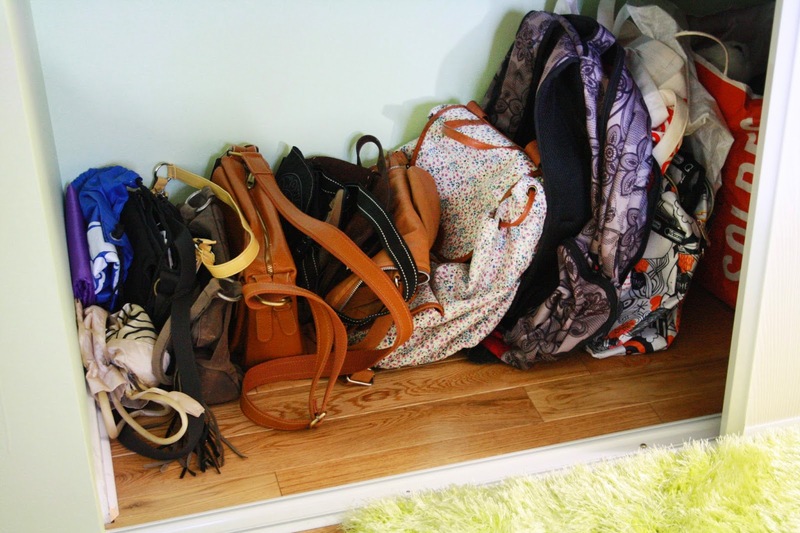 Normally, I would keep all my bags on the floor in my closet. Be sure to take some time to go through your bags, throw out anything you don't need, and potentially find anything you thought you had lost. Then store them or hang them up wherever your bags go and keep them out of the way! 13. Healthy food is a must. I'm a hypocrite. I indulge far too often in chips and popcorn to be healthy. 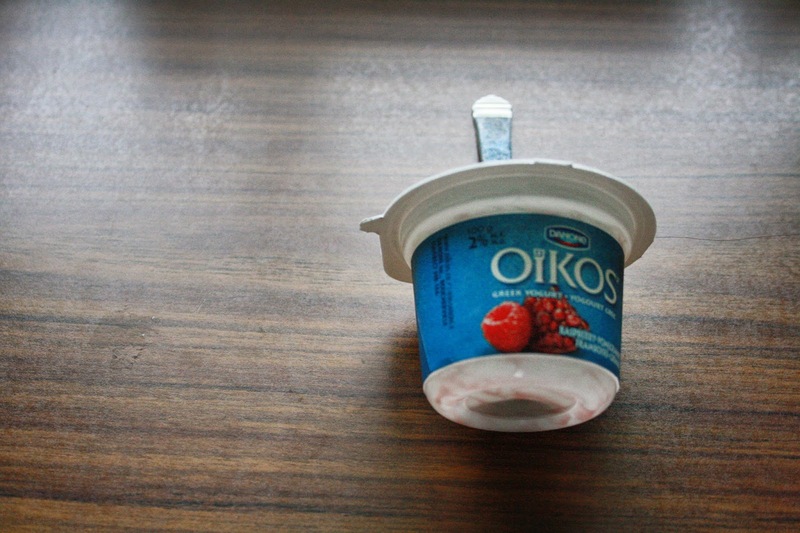 I have been trying lately to eat more fruits and vegetables and have found a new obsession with yogurt. So be sure to add some healthy snacks onto the grocery list for the next shopping run! 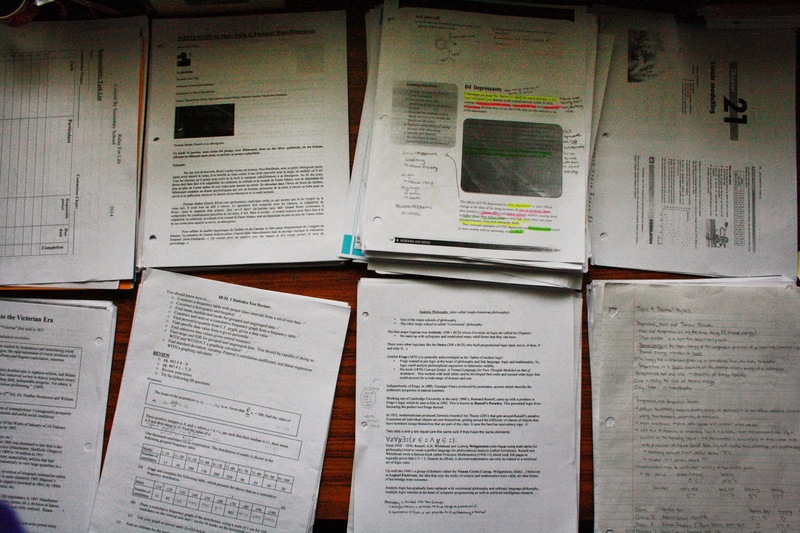 And those are my tips to re-organizing your school life for maximum efficiency while studying. Clutter is not only a hazard while walking around in your room, but is also a big distraction while trying to study. So clear up your space and good luck on the busiest season of your school year! How do you like to organize your school life? 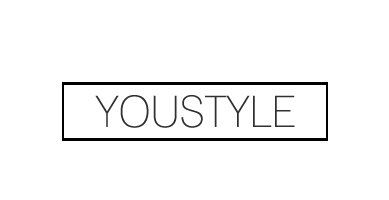 I agree, it often takes me a whole day to clean everything up, but it's always worth it when you look at your finished product :) I'll be sure to check out your blog!